Representative Honours: Northern Ireland: 3 Full Caps (1986-1987), Youth Caps. Club Honours: (with Manchester United) FA Youth Cup Runner-Up 1981/82. Phil Hughes chose to join Leeds United in 1983 after serving an apprenticeship with Manchester United believing there was little chance of a firstteam breakthrough at Old Trafford. At Elland Road too his chances were limited by the presence of Scottish international David Harvey, before the signing of Mervyn Day mid-way through the 1984/85 season ensured that Hughes had no future in Leeds' first-team. A former Northern Ireland Youth international, in late-1984 he was included in the full international squad for the first time. Signed by Bury in the summer of 1985, Hughes established himself imediately in the first-team and despite the Shakers finishing 20th in Division Three (just three points away from relegation), his consistent performances convinced Billy Bingham to select him ahead of George Dunlop for the 1986 World Cup Finals squad. With Pat Jennings retiring after the World Cup in Mexico, Hughes was chosen for Northern Ireland's first game without the legendary 'keeper. The inexperienced team suffered a 3-0 defeat at the hands of England, as Hughes became the first, and to date only, Bury goalkeeper to earn caps while with the club. Two further caps were added in the draws with Turkey and Israel later that season. A shoulder injury picked up in the second half of the 1986/87 season ruled Hughes out for a lengthy period, and in the meantime his Northern Ireland place was taken by George Dunlop, then Allen McKnight. He never really recovered his form and was allowed to join Wigan Athletic for £35,000, after an initial brief loan, in November 1987. Although Wigan were firmly a Third Division side at the time, Hughes was given another chance to play at Wembley, in the Mercantile Credit Football League Centenary Tournament, and saved a penalty in one of the tournaments many shoot-outs. 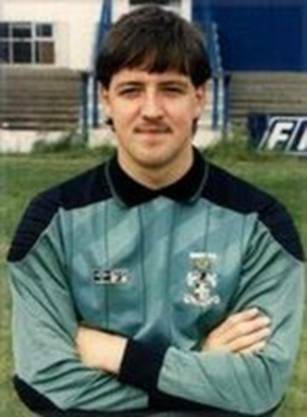 After 99 League games in four years at Springfield Park, Phil Hughes was allowed to join Rochdale in 1991 on a free transfer. Hughes finished his League career with a season at Scarborough, retiring at the age of 27 after suffering from recurring shoulder injuries. He played non-league for Guisely and later combined his job as a policeman with coaching youth football. Hughes has since acted as goalkeeping coach at Leeds United, Grimsby Town and, from 2004 to 2010, Burnley. In January 2010 he was briefly caretaker-assistant-manager at Turf Moor following the resignation of Owen Coyle. Hughes and Coyle were later re-united at Bolton Wanderers (2010-2012), Wigan Athletic (2013) and Houston Dynamos (2015-date). Summary: 3/0. Won 0, Drew 2, Lost 1.